This experience carries the essence of the Sassanid realm, in a groundbreaking blend of art, history and cultural immersion. It’s an expedition from the dazzling Tang-e Chogan, nested in a fertile valley at the foot of the Zagros Mountains, to the cryptic temple of the ancient city of Bishapur. An adventure within the spirit of three major ethnic groups of Iran, living in the same spot of the Fars region, but according to their own local customs, ancestral cultures, and lifestyle. You’re going to feel like an explorer, on the footsteps of the Sassanian kings! This experience is a plunge into history, in the archeological landscapes of Tang-e Chogan, a region registered by UNESCO on the World Heritage List. In the heart of the Fars province, enter the ancient city of Bishapur. Dating back from 224 and 658 of our era, it was one of the biggest cities of the Persian Empire, and has a unique combination of Persian and Roman art and architecture. 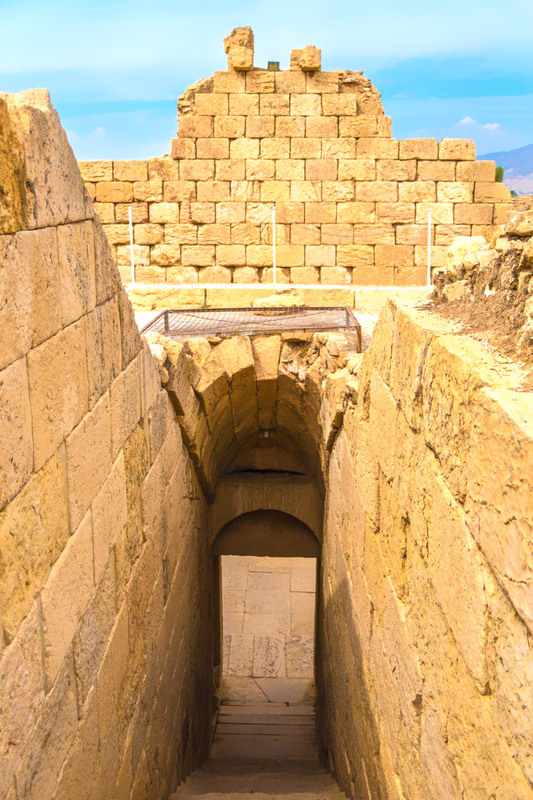 Crawl into abandoned vaults, explore tunnels and undergrounds, and walk among the numerous vestiges… The most impressive is the beautiful “Anahita-temple”, a Zoroastrian temple dedicated to the water goddess, that will struck you in awe. Almost intact after centuries, this site has kept an incredible spiritual atmosphere. 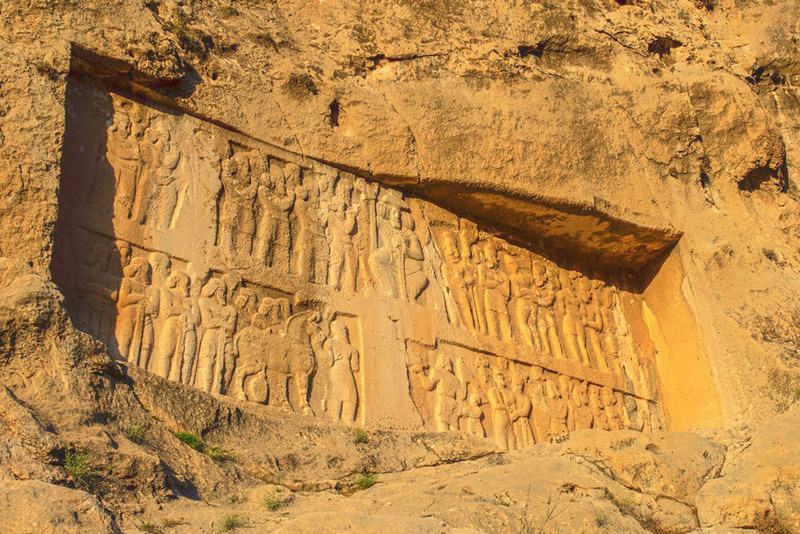 The sound of the trickling water soon calls you by the side of the Bishapur River gorge... As you approach, you can face six impressive reliefs carved into the rock. They celebrate the triumphs of the Sassanian kings over Rome. With incredible details and precisions, they recall their stories, leaving the visitor breathless in admiration. A few kilometers away, hidden in Shapur’s cave, rests a masterpiece of the Sassanid era. Gather your strength to get to this mysterious treasure, by climbing the inner side of the mountain. Reaching the altitude of 800 meters might be arduous but the incredible sight uphill will release you from any tiredness. 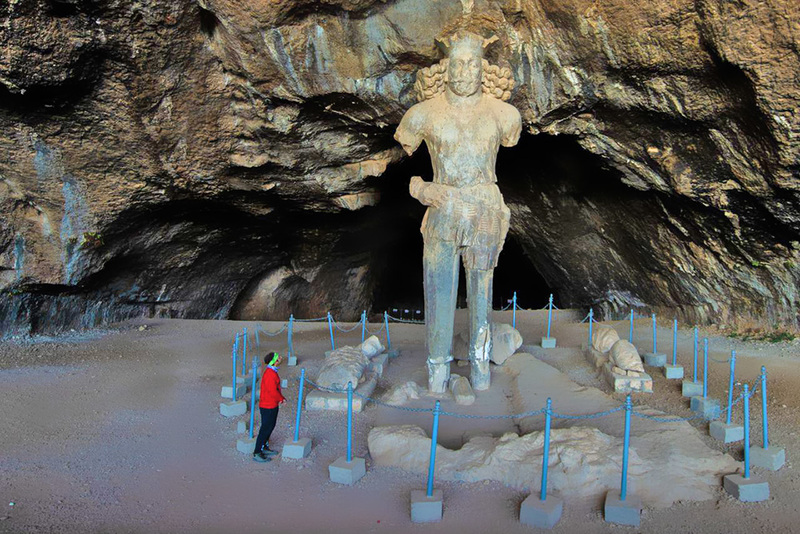 Step into the wide mouth of Shapur's cave to discover a 7 meters-high statue of Shapur I. This colossal work of art was carved more than 1500 years ago, and has still gentle details to spark amazement in the eyes of the visitor. 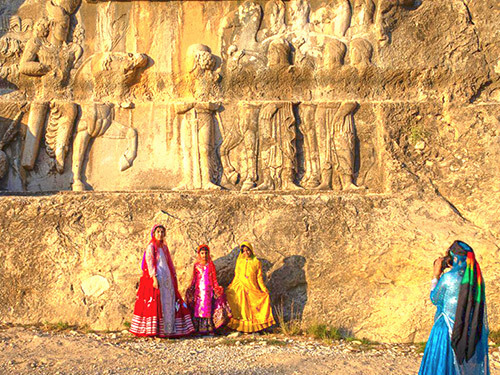 Aside from the archeological wonders, Tang-e Chogan is also home to three different ethnic groups: Lurs, Fars, and Turks live peacefully side by side. By visiting five villages you can get to know their noble cultures, traditions, and lifestyle. 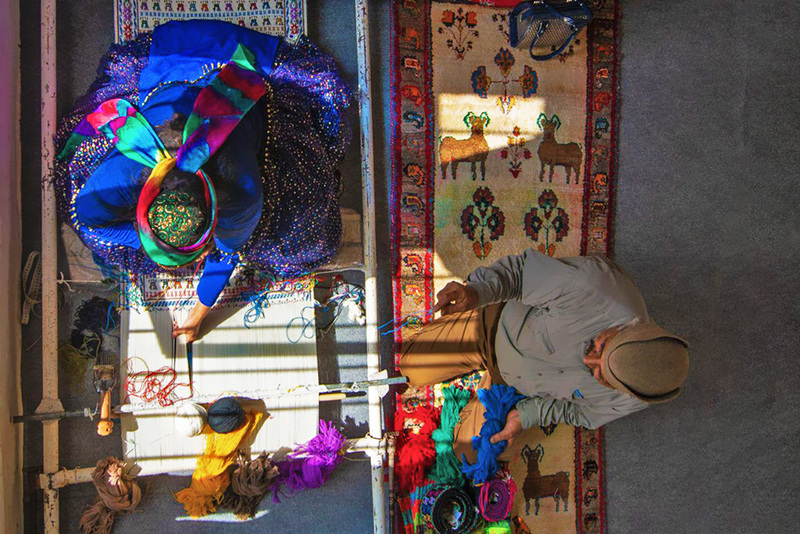 It’s a unique opportunity to visit local workshops where villagers produce handicrafts according to ancestral techniques. We can support preservation of these ancestral arts by purchasing them directly from local artisans. In “Darreh Shouri” village, cross the threshold of a villager's house to meet a woman manufacturing products. She will introduce you to ancestral weaving techniques. Then we go to “Kashkuli” village, to visit Mr. Pirazin’s workshop: While carving with precision a replica of the Sassanid rock relief, he will share everything about his art, known as “Hajjari”. 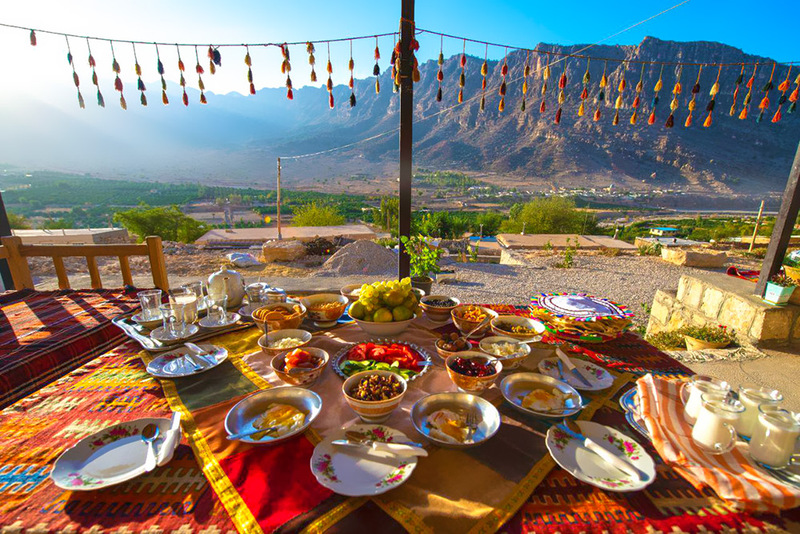 You also have the chance to taste delicious homemade foods with locals, and even to learn how to cook the traditional “Ash-e-Shole Majaki”! For that, you will need to grind almonds with an antique rotational stone! As the night falls down on the quiet valley, the mind filled with wonders, appreciate a night out of time in the quietness of a traditional village, at the vicinity of some of the most precious archeological sites of once great Persia. The tour starts at 7 A.M. from Shiraz, with private car to “Bishapur”. Arriving around 9:30 A.M. visiting ancient city until noon. Then, we drive toward a local guesthouse in Darreh Shouri for lunch. Being introduced to the traditional methods of weaving in the village. Visiting “Tang-e-Chogan” gorge and amazing Rock Reliefs till sunset. At nightfall, we come back to the guesthouse for a traditional Persian dinner before sleeping. Wake up early at 7 A.M. to go to the “Shapur” Cave, have a local breakfast on the site. Climbing and exploring the cave takes between 3 to 5 hours. Return downhill around noon to visit the Turkish Qashqai village of “Kashkooli”. Meeting Mr. Pirazin's stone carving shop. For lunch, we return to the guesthouse where a local and organic meal is waiting for us. After some relaxing, heading back to Shiraz city of verve.